Jacob, Starla, Molly, Nathan and Michael are just a few of the children across the country with a remarkable medical story to tell thanks to the treatment they received at Children’s Miracle Network Hospitals® (CMN Hospitals). Every minute, 62 children enter a CMN Hospital for treatment. To raise funds to help save and improve the lives of those children, participating DQ Grill & Chill® and Dairy Queen® locations throughout the U.S. will celebrate the 10th Annual DQ® Miracle Treat Day on Thursday, July 30. During Miracle Treat Day, $1 or more from every Blizzard® Treat sold at participating locations will be donated to CMN Hospitals, which raises funds and awareness for 170 children’s hospitals across the U.S. and Canada. All funds stay in local communities. Last year, Dairy Queen operators across the U.S. and Canada raised nearly $5 million on Miracle Treat Day for CMN Hospitals. Since 1984, the Dairy Queen system has raised more than $100 million for the charity through fundraising efforts including will serve as this year’s honorary spokesperson for DQ Miracle Treat Day. Miss America titleholders have been involved with CMN Hospitals by visiting member hospitals and helping with fundraising activities since 1989. The featured Miracle Treat Day Blizzard Treat of the Day is Oreo®, the most popular Blizzard Treat to date. The Blizzard of the Month for August in the U.S. is ROLO® Minis, featuring creamy vanilla soft serve blended with ROLO Minis and swirls of smooth caramel. All other Blizzard flavors are also available that day. 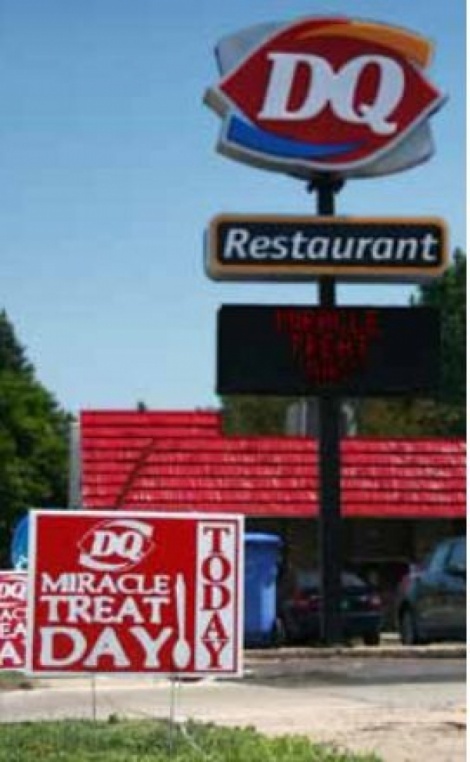 This Miracle Treat Day also comes during a special year for the Dairy Queen system, which is celebrating its 75th anniversary. For more information about the Dairy Queen system, visit DairyQueen.com. Connect with the DQ system on Twitter using #LOVEmyDQ and at twitter.com/ dairyqueen. Visit the DQ Facebook fan page, which has more than 9.6 million friends and become a friend at facebook.com/dairyqueen. Children’s Miracle Network Hospitals® raises funds and awareness for 170 member hospitals that provide 32 million treatments each year to kids across the U.S. and Canada. Donations stay local to fund critical treatments and healthcare services, pediatric medical equipment and charitable care. Since 1983, Children’s Miracle Network Hospitals has raised more than $5 billion, most of it $1 at a time through the charity´s Miracle Balloon icon. Its various fundraising partners and programs support the nonprofit’s mission to save and improve the lives of as many children as possible. Find out why children’s hospitals need community support, identify your member hospital and learn how you can Put Your Money Where the Miracles Are, at CMNHospitals.org and facebook.com/CMNHospitals. American Dairy Queen Corporation (ADQ), which is headquartered in Minneapolis, Minn., develops, licenses and services a system of more than 6,400 Dairy Queen® stores in the United States, Canada and 25 other countries. ADQ is part of the Berkshire Hathaway family of companies led by Warren Buffett, the legendary investor and CEO of Berkshire Hathaway. For more information, visit DairyQueen. com.